And now I begin to understand all those bowling ball metaphors! 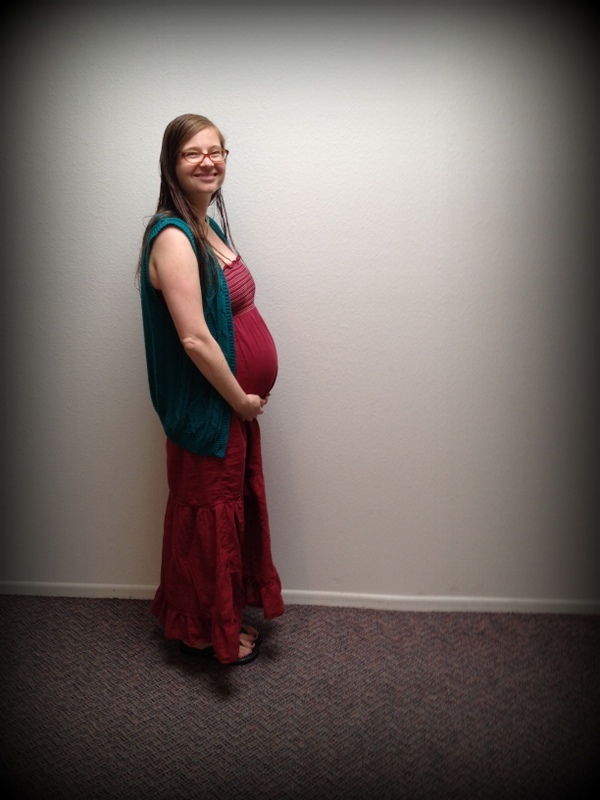 I am getting seriously big, which is to say, my little passenger is getting seriously big: over 3 pounds! I am so grateful for every day he’s in there growing away. The biggest change this week is that I feel all of his movements now instead of just kicks. Every time he shifts, I can tell exactly where he is. It is the strangest sensation, but I kind of love it. I know things are getting more crowded for him in there, and soon I’ll reach the trapezoid belly stage. As of right now, I can distinctly feel his legs and can usually tell where his back is. He seems to like hanging out on my left side. I definitely have to get up more in the night now, and I think my sleep is probably going to get more erratic from here on out. Good practice for what’s to come. I still have to eat something in the night, but how hungry I am in general seems to change week by week. Depending on whether or not he’s having a growth spurt, I either have to eat something every two hours, or just one extra snack before bed in addition to my regular meals. I am still craving fruit (cold. cold fruit!) and ice-cold water. We are making progress of prep work. This weekend we worked on the registry, and the baby shower invites are ready to send out (more on those soon, mostly because Hillary and I had so much fun making them!). I finally made my way through the baby name book, and now we are ready to have our Name Summit. Exciting! 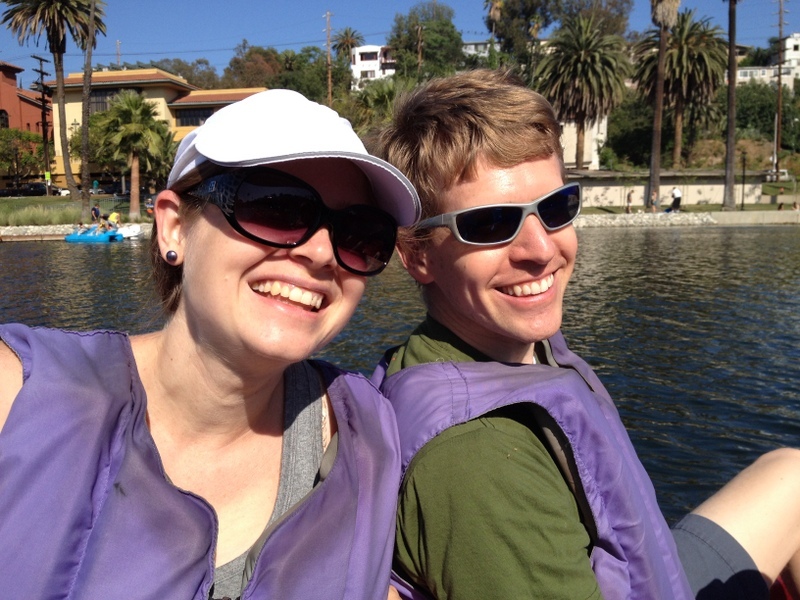 This weekend we also had the chance to go paddle boating with some sweet friends of ours, who, blessedly, live only about 10 minutes from us. That is an LA miracle. The guys did all the paddling while the ladies chatted in the back. It was the loveliest afternoon and something I’ve been wanting to do for the longest time. So glad we squeezed it in! Thank you so much! Definitely happy and grateful to be healthy too! I was reading excitedly when I saw the mention of a baby name book, garbled the words, and thought you had picked the name “Summit” in which I thought it was a pretty neat name. Lol. Haha, that’s awesome! You are welcome to use it for any future babies! 🙂 Thank you so much for the well wishes! I have been taking comfort in what you told me about Luna sleeping through the night when you were pregnant…so far he has never woken me up with his movement, but he is very active during the day. Here’s hoping we’ll have a good sleeper! But we’ll love him to pieces even if he’s not! It is so lovely to have your little friend in there growing, and you know just where he is and what he is doing. After he presents himself to the world you may find yourself clutching the place where the bowling ball used to be and saying,”Where’s my baby?” That is a precious shot of you and Eric! Aw, thank you! Eric and I were looking at old pictures the other night, and he was saying how weird it was to see pre-pregnancy pictures of me because he kept thinking, “Where’s the rest of her?” Funny how quickly you get used to something! What a happy family you two are! unfortunately my cravings are not as healthy as yours…but totally understand the overnight problem of having the get up to go to the loo, and the kicking in the bladder surely doesn’t help. Has baby moved into position yet? I can’t really tell how mine is positioned as I usually feel the kicks in 3 different places at the same time…talking about words wisdom from a second-time mum-to-be! Thank you so much! I can’t tell yet if he is locked into position, but I do think he is head down for the most part. Can’t tell yet if he is posterior, but I am doing my pelvic rocks to turn him if he is! I also get those all-over kicks, like he is just splayed out like a starfish in there! I definitely have my share of unhealthy things too…I really think I would eat almost anything these days as long as it’s cold! Have you tried any frozen grapes lately? No, but that sounds heavenly! Shelly! I have missed you! Thank you so much for the well wishes! We are really excited and so looking forward to meeting our baby! Hope you and the family are doing fantastic! !